Good day everyone, I hope I'm not asking about a problem that has been solved before, but I've looked around and can't find a solution on my own. 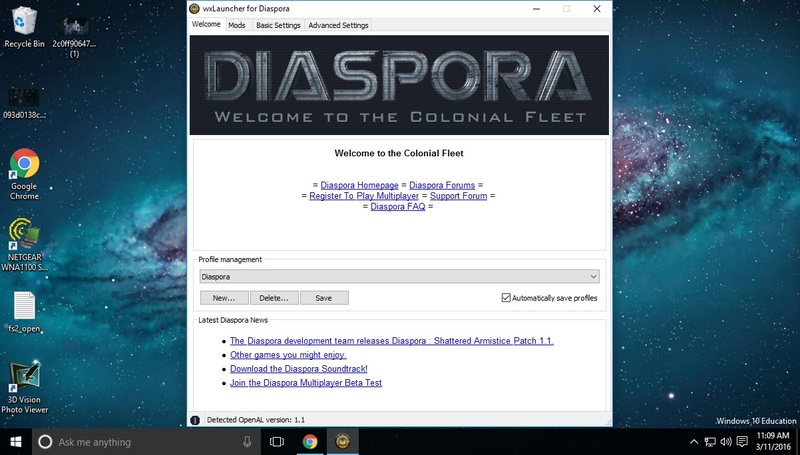 I'm setting up Diaspora on a new system, ran the original installer and both patches, but when I open the launcher the PLAY button will not work. I've tried both the standard Diaspora executable and the Debug version, but it won't open the game. On the error side of things, I have the message "Error Opening Device". I tried the normal instructions to get the fs2_open.log file, but without being able to run the game I'm not sure how else I can obtain it. Any assistance would be greatly appreciated. Awesome, that part worked like a charm. My fs2_open.log file is attached to this message. So, did anyone have any thoughts? I'm still stumped, I've tried reinstalling from the ground up, reinstalling OpenAL, and I can't get the game to launch. Any assistance is appreciated. Sorry, I forgot to reply to this! Unfortunately I can't see anything wrong in the log that you've provided, so maybe the problem is in wxLauncher rather than the exec. Could you try posting screenshots of your wxLauncher config? i.e. one each of the Welcome, Mods & Basic Settings Tabs? We can ignore the Advanced Settings tab for now. Oh. What's your screens resolution? Is the vertical dimension less than about 660 pixels? I think you might need the solution in this thread; i.e. manually create a cmdline_fso.cfg file, then bypass the launcher & run the executable directly. Does wxlauncher included in Diaspora work on Windows 10? It is a bit outdated. Outdated maybe, but it works perfectly fine. Even the old 5.5 launchers run, yet they seem to hate Win10 Registry. Thanks folks. I'll give these a try when I get home, out of town for work. I'll report my findings! i've down loaded it on torrent which wont work and direct which downloads it but then wont get me to the game launcher. The launcher should be an icon on your desktop (on Windows at least). Is that not running? To be honest, the best way get and run Diaspora these days is via Knossos but I don't blame you if you don't want to download it again. I cannot get this to work in Ubuntu 18.04 with either knossos, or wxlauncher from the repository. It does the same thing in both. When the tips box pops up, all input is disable. It works 16.04 in wxlauncher from the repository up to a Virgon mission which just crashes. Gonna try knossos in ubuntu 17.10 next??? That sounds like an SDL2 problem. Do you know which SDL2 versions you used on 16.04 and 18.04? It actually seems to be a gnome3 desktop issue. Works great on Xubuntu 18.04......Oh and intel graphics on my linux lappys works fine. Thanks Kara, trying the Knossos now. I keep getting too many tangential discussions for what works etc... Had troubles with my FS2 running right trying to copy the files from old hard drive to new one. Just missing too many installers or their broken after being gone for many years.